Knockout Font Features: Nine Widths | Hoefler & Co.
Packaged in seven different series, Knockout’s unusually broad array of nine different widths steps gently from supercompressed to extrawide. 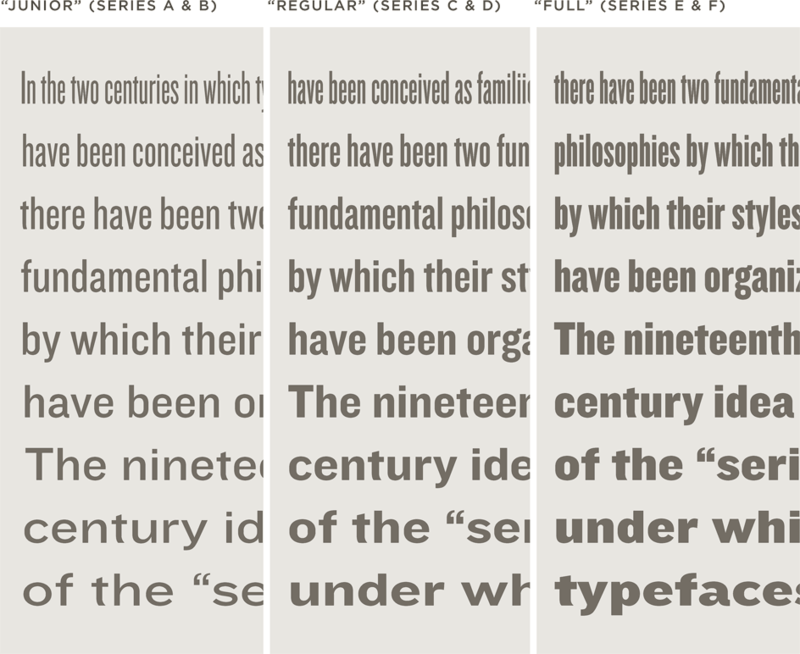 The light and narrow styles of Knockout Series A share the matter-of-fact qualities of the other Knockout variations, but are considerably airier. Welcoming and credible, these faces are especially useful for covers. Knockout Series B performs admirably in small sizes, making it a perfect choice wherever space is limited. Maps, charts, forms, listings and legal notices shine in the wider fonts; No. 34 reads at 3-1/2 point! Editorial designers like Knockout Series C for supporting copy. Subheads, sidebars and pull quotes often demand a face bold enough to attract the reader, but modest enough to defer to the headline. The open counters, generous fit, and high contrast of Knockout Series D make it sturdy enough to work in small sizes, like Series B. But its additional weight helps it rasterize nicely, making it especially useful online. The fonts in Knockout Series E are classic headline faces, created to thrive in tight settings. Its widths are closely related, so unexpectedly long headlines can be easily accommodated by moving from one style to the next. Not merely a boldface, Knockout Series G was designed to be stackable. Its overstuffed curves and broad x-height guarantee that every setting is as black as possible.